As the tide of information coming from the web and through social networks like Twitter and Facebook continues to increase by the day, a range of services have sprung up that try to help us filter that tide — or at least surf it more easily. 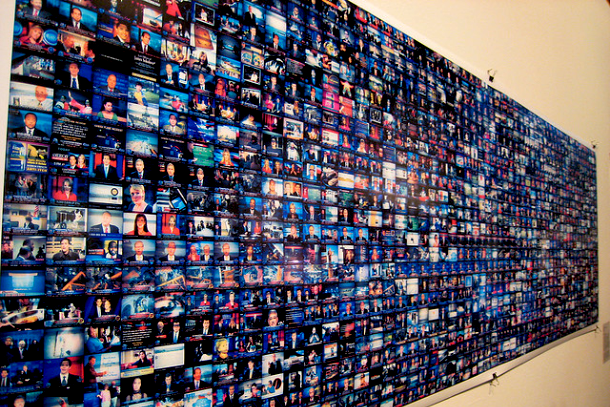 Tools like Storify allow individuals to hand-curate information, while others such as Zite use algorithms to suggest topics worth following. One of the newest services in this area is called Bottlenose, which just launched as an invitation-only beta, and it’s interesting in part because co-founder Nova Spivack is a long-time web entrepreneur. But while it has some interesting filtering features, I’m not sure Bottlenose is going to appeal to the average digital-information junkie — at least, not in its current form. Bottlenose got some buzz earlier this year when there was a report that Twitter was interested in acquiring the company, although that has never been confirmed by anyone at Twitter — and Spivack has said only that he and his co-founder Dominiek ter Heide had discussions with the real-time information network, but that it made more sense for the company to “be neutral.” Bottlenose currently connects to and pulls information from your Twitter and Facebook accounts, and Spivack has said that the service also plans to add support for Yammer and other social-media streams in the future. It’s never been easier to share — People are sharing more kinds of information, more often, with more people, than ever before. And it’s requiring less thought too — because the messages themselves are so short. This is resulting in a collective overshare of unimagined proportions. Bottlenose tries to filter all of this information in a number of ways, but one of the most interesting is through the use of algorithm-driven “assistants” — in effect, widgets that you can activate and add to your dashboard. These show you messages and other content from people that the service thinks you would be interested in, and Spivack says they will learn from your activity on those networks. So you can choose to see news from those who are most influential on Twitter (as ranked by the influence engine at Klout, a company that Spivack is also an investor in) and you can see posts that Bottlenose thinks you might want to share — which are presumably based on your prior retweeting or sharing activity. 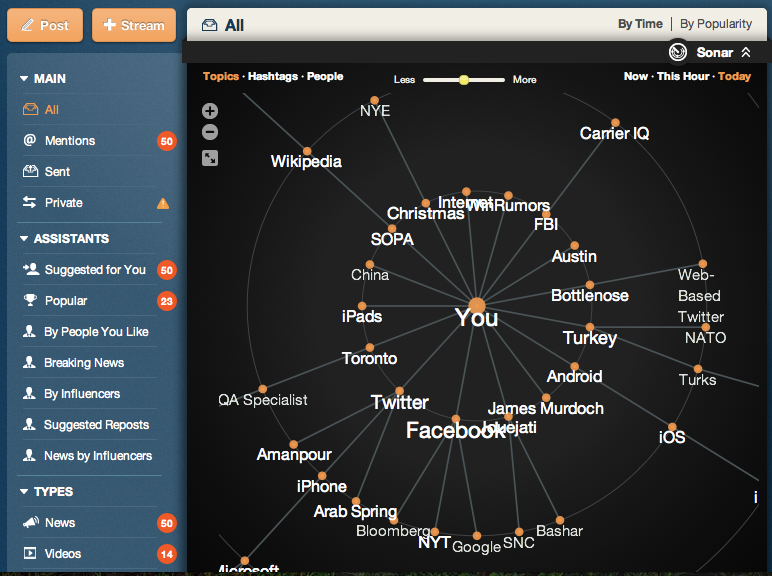 The other interesting element to Bottlenose is what the service calls its “sonar” view: this is a graphic representation that can show either the topics that are being discussed in your social sphere or the individuals who are closest to you. It’s a little like a similar graphic feature in Google+ (which Bottlenose doesn’t support yet) called Ripples, which shows the connections from your social network who shared or commented on a specific post. My only issue with this kind of feature is that while they look pretty and can be fun to play around with, I’m not convinced that they have a huge amount of utility for the average user — most of whom I suspect will never actually use them. That’s part of my criticism of Bottlenose as a whole, in fact. It’s a little too complicated for the average social-network user, with its various features and settings (and a user interface that could use some work, in my view). The company says that it is aiming itself at “power users” such as those who run social-media accounts and campaigns for companies and brands — which puts it in the same market as other tools such as Tweetdeck, HootSuite and Seesmic (which also shows you a user’s Klout score next to their tweets). 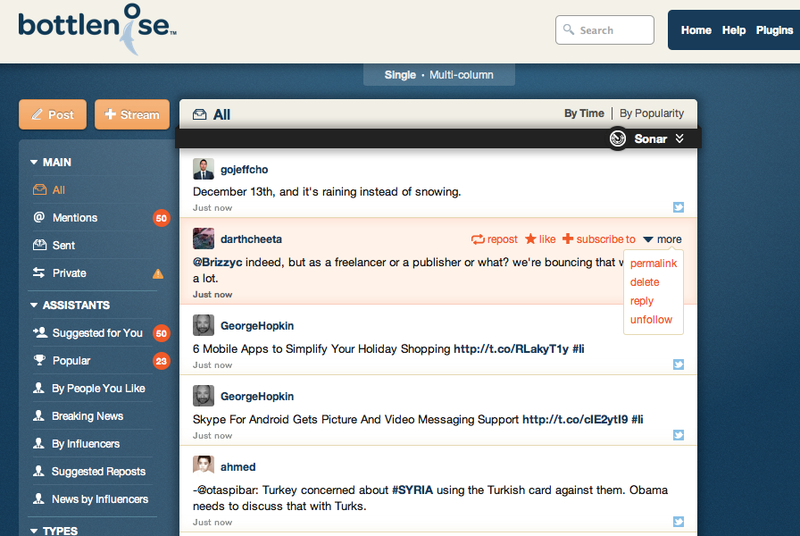 But it’s not clear to me that Bottlenose has a compelling advantage.